Our Alcatraz Tour is for real. You go to prison. You see it all. We operate all year round and have sold thousands of Alcatraz Tour tickets since 2011. It is really a unique experience and a highlight of a San Francisco trip. Our Alcatraz Tour is bundled in a package described below and cannot be sold separately. It sells extremely fast during summer and major holidays. 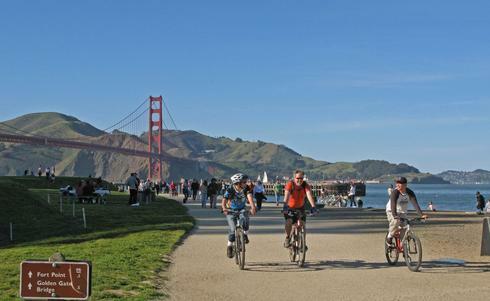 Our package includes a guided bicycle tour across the Golden Gate Bridge and a bay cruise with a walking audio tour of the famous Alcatraz Island. And YES, our package includes an actual landing on the island, where you can set foot, visit the cells, prison yard, etc., like a convict! The only way to reach Alcatraz is by sea! Ferries leave from Pier 33 at scheduled times to take you to Alcatraz Island. You can already see the Island from Fisherman’s Wharf since it is located just 1.25 miles (2 kilometers) at sea. The Rock, as it is known, covers 25 acres. It has direct exposure to oceanic winds, humidity and intense corrosion. The currents surrounding the island are treacherous. Alcatraz is a National Park. Since Alcatraz is under the umbrella of the National Park Services, you will be welcomed upon arrival by a National Park Ranger. At that time, a brief orientation will be given to you. You can visit the island and its jail house at your own leisure and rhythm. One interesting stop is the theatre with its continuous video orientation with historical footages of the major events that took place at Alcatraz. We definitely recommend the 45-minute audio self-guided tour so that you do not miss anything. It is available in English, Spanish, German, French, Italian, Japanese, Dutch, Mandarin, Russian, Portuguese and Korean. The Audio tour is included in our package. 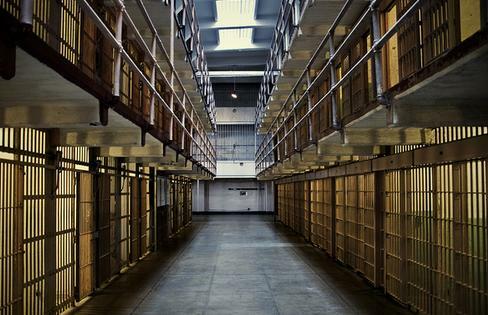 This tour will take you through the cell block and narrate various stories that took place there. You will hear testimonies of former inmates and guards. 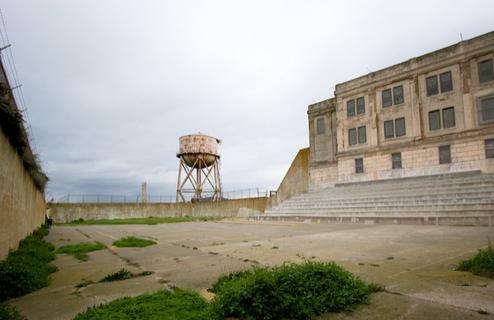 You’ll have a chance to see the inmates cells, the solitary confinement area, the yard and dining area, and more… After the audio tour, we suggest you take a look at the structures around, including the guard accommodations, the Alcatraz Museum, its bookshop, and the gift shop to grab a few Alcatraz souvenirs before heading back to the mainland. 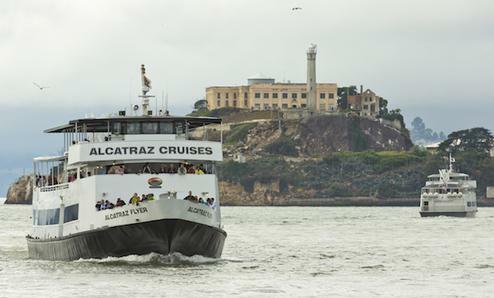 Alcatraz Cruises ensures the transportation back and forth from the island. It is about a 20mn to 30mn cruise with fantastic views of the Bay and the City. While your Alcatraz tour leaves on a specific day and time, you can do your guided bike tour ANY DAY within 24 hours of your Alcatraz tour (Day before, same day, day after). 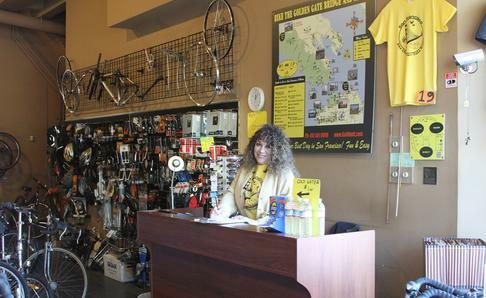 The guided bike tour leaves our store at 10:00 am daily (please arrive 15 to 20 minutes before 10) and lasts about two and a half hours to take you to Sausalito. Once in Sausalito, you are free to either spend more time there or hop back on a Ferry to San Francisco (Bike is free on the Ferry). You have the bike until 8:00pm. Guided Tour is $70.00 and included in your Alcatraz package. For the period September to June, the Bike Tour is Self-Guided exclusively and is $29.00 included in your Alcatraz package. Self-Guided Tour: Just call the Shop the evening before, and your bike will be ready for you to pick-up the next day . Plan on 2 to 3 hours to cross the Bridge and back, or more if you want to see other areas. NOTE: Alcatraz Tour & Bicycle Tour can be done on DIFFERENT days. All our bikes come with a lock, a helmet, a map and a flat repair kit. Cannot be sold separately . Non refundable. Alcatraz part is free for children 4 and younger. Bike part is $20. The Alcatraz Package can be purchased directly at our Store at 2011 Mason street (open 7 Days from 8am to 8pm) or securely online. Thousands of Tickets Already Sold!